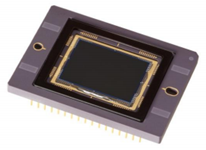 The KAI-08050 Image Sensor is an 8-megapixel CCD in a 4/3” optical format. Based on the TRUESENSE 5.5 micron Interline Transfer CCD Platform, the sensor features broad dynamic range, excellent imaging performance, and a flexible readout architecture that enables use of 1, 2, or 4 outputs. The sensor supports full resolution readout up to 16 frames per second, while a Region of Interest (ROI) mode supports partial readout of the sensor at even higher frame rates. A vertical overflow drain structure suppresses image blooming and enables electronic shuttering for precise exposure control. The sensor is available with the TRUESENSE Sparse Color Filter Pattern, a technology which provides a 2x improvement in light sensitivity compared to a standard color Bayer part. The sensor shares common pin-out and electrical configurations with other devices based on the TRUESENSE 5.5 micron Interline Transfer Platform, allowing a single camera design to support multiple members of this sensor family.